The Switch’s answer to Spelunky? Flinthook makes a strong first impression: a wondrous, endlessly charming intro that sums up our hooded hero’s quest by way of a Saturday morning cartoon. It’s celebratory, cheerful, exciting, with the raddest Genesis-era chiptune I’ve heard this side of the Milky Way. Originally released in 2017 and ported to the Nintendo Switch this past March, Tribute Games’ Flinthook is an action-platformer ‘roguelite’ — a cocktail of a roguelike’s permadeath with added progression elements to soften the blow. Playing as the eponymous space-pirate scoundrel Flinthook, the player takes down pirate crews one after another until they either die or defeat the ‘bounty’ (the boss). Since it’s a roguelite, it’s got the expected gameplay loop: play, learn, die, grow, then repeat. Following the Metal Slug-inspired Mercenary Kings, Flinthook harkens back to Tribute’s beloved 2010 beat ‘em up Scott Pilgrim vs. The World with its decadent 32-bit designs and backdrops, gorgeous and almost hypnotic animations, and its wonderfully punchy gameplay. A soft, vibrant colour palette of pinks, purples, greens and navy blue draws together a nautical-themed cosmos of wood-panelled spaceships and musket-like ‘Blasma’ pistols. Topped off by Patrice Bourgeault’s killer chiptune soundtrack, an energetic array of 16-bit-inspired tracks that perfectly compliment the game’s fast-paced immediacy and relentless charm, Flinthook is stacked with aesthetic splendour. With its Switch port, Flinthook finds its true calling as a portable title. Its short gauntlet runs, themselves split up into shorter, isolated bursts of action, its coherent interface that’s readable at a glance, its compact screen-sized rooms, the visuals that pop on the high-quality IPS screen and a very steady framerate – it’s so perfect you’d think it’s an exclusive. The Switch’s small Joy-Con controllers aren’t quite up to the task, especially with their smaller, nubby analogue sticks, but this issue fades with practice. 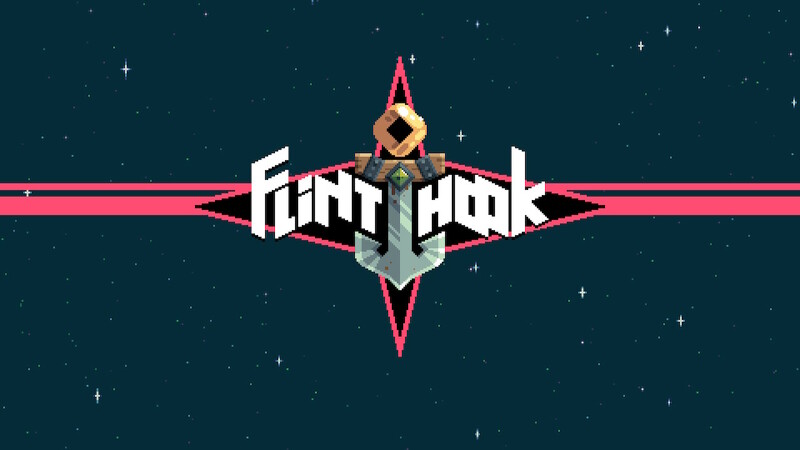 As a platformer, Flinthook’s gameplay comes down to precision and control, relying on two things in particular: the ‘Chronobelt’, a recharging sliver of slow-mo to help with platforming and combat; and the ‘Chainhook’, a grappling hook that pulls you gracefully (or not) across each room. Flinthook’s ‘Blasma’ pistol (the main method of attack) and the Chainhook are joined at the hip: a short-range blaster that’s more dependent on the player’s mobility than their aim. Though the Chronobelt is just as important as the Chainhook or pistol, the three don’t mesh together as well as you’d want and you’ll forget the Chronobelt as often as you remember it. It’s an issue that’s crops up more as the difficulty rises: without being upgraded, the slow-mo ability feels more supplementary than mandatory. It’s too short to feel useful or reliable, and it trips the player up more often than not because it’s so limited. The gameplay is slightly flawed, but it’s the roguelite elements that really trip Flinthook up. Like The Binding of Isaac or Enter the Gungeon, Flinthook’s dungeon-like pirate ships are procedurally-generated on a higher level, but each room – each chunk or step of the dungeon – is fixed, with only a few genuinely random elements. Each room is largely handcrafted: enemy encounters are fixed, hazards are fixed, room layouts are fixed, and these fixed elements are mix-and-matched into a wide variety of potential rooms. It aims for a balance between handcrafted level design and chaotic, endless variety. As a roguelite, Flinthook has its strengths: levels are straight up races, bursting through each room as flawlessly as you can before you lose too much health. Since health is your only genuine resource (more on that soon), it actively discourages backtracking and scavenging that bloats other games in the genre. It gives Flinthook a brisk pace to match its breezy gameplay and is genuinely refreshing and appealing for someone who’s played a lot of the genre. Its weak spots, however, really hurt in the long run. For one, difficulty levels – choosing between harder or easier ships each round – aren’t incentivised at all, and there’s no point whatsoever in risking life for gold or upgrades. It means that taking the easiest route possible and the fastest route through each ship (if you can) is always, always the best idea. It lacks variety and a proper risk-reward system. In addition to this, sudden difficulty spikes risk exactly what you don’t want in any roguelite: the feeling that you’ve hit a wall, that there’s nothing to learn or improve at in order to progress, and it makes for a more frustrating game than an enjoyably difficult one. As you progress, you get the sense that there are more and more hazards and room layouts designed to simply seep your health away (hidden spike floors are the main offender here) and game-ending difficulty spikes become far more common. When it feels like there’s nothing to actually learn and adapt to, the motivation to continue playing a roguelite just disappears. The gameplay is admirable but it’s a darn shame that the roguelite built up around it is so limited. Between the snap of the Chainhook, the bright short-range jolts of the Blasma pistol and the tense thrills of the slow-mo-powered Chronobelt, it’s sad that Flinthook’s gameplay is trapped inside its AI-driven level design. It’s easy to imagine a fully-fledged action-platformer that, paired with its inspired aesthetic and music, dives headfirst into its Mega Man and Sonic The Hedgehog inspirations to craft something even better. Flinthook’s addictive fun the way any good roguelite is, but it doesn’t rank among the best of the genre. Not every roguelite strives for endless value like Spelunky or Isaac, but Flinthook runs out of that exciting, enticing energy too quickly. It doesn’t convince you to hammer away at that wall ahead of you until you’ve finally broken through, that it’s worth spending all that time improving and learning to reach its end. Even on the Switch, its natural home, Flinthook is a bittersweet mix of fun and flawed that caters most to platformer enthusiasts and too little to everyone else. It’s definitely worth playing at a $18.30 AUD price point – one of the lower priced games on the Switch’s eShop – but don’t expect Flinthook to hold your attention as long as its contemporaries. Flinthook almost captures the platforming perfection of Spelunky – almost. It’s fun, polished and crazy charming – and, as a portable title, even better on the Switch – but its list of issues keep it from roguelite greatness.